DURING THE OBAMA years at the White House, Michelle Obama became America’s sweetheart. Now two years into Trump’s White House stint, Michelle has released her memoirs. It’s the first book written from her perspective about life as the wife of the commander-in-chief, but it’s also about much more than that. In Becoming, America’s first Black First Lady provides a unique insight into the trials, fears and practicalities of life in the White House and beyond. The job of First Lady of the United States isn’t an official role, but democrat or republican most agree its one Michelle Obama made her own. A significant portion of the 400-page tome is dedicated to her life before the public spotlight. Michelle paints an idyllic picture of growing up on the south side of Chicago, in a one-bedroomed apartment. Her aunt and piano teacher Robbie lived in the apartment below. It wasn’t until Michelle got to Princeton that she learned “what it felt like to be the only black woman in a room”. Because people often ask, I’ll say it here directly: I have no intention of running for office, ever. I’ve never been a fan of politics, and my experience over the last 10 years has done little to change that. However as we’ve seen in our own recent Presidential election, she wouldn’t be the first to change her mind. When I was a kid, my aspirations were simple. I wanted a dog. I wanted a house that had stairs in it – two floors for one family. I wanted, for some reason, a four-door station wagon instead of the two-door Buick that was my father’s pride and joy. The book brings us through the Life and Times of Michelle, from a middle class south side Chicago to Princeton and a high flying career as a lawyer. It’s a personal memoir which documents her life in her often very honest words. In her signature style Michelle makes clear her disappointment at the current President and his strategies. What if someone with an unstable mind loaded a gun and drove to Washington? What if that person went looking for our girls? Donald Trump with his loud and reckless innuendos, was putting my family’s safety at risk. And for this I’d never forgive him. In Michelle’s account of the now infamous 2016 election night, which saw Donald Trump win out over Hillary Clinton, the then First Lady took to her bed, hoping to “block it all out and go to sleep. I understood what was probably happening, but I wasn’t ready to face it”. And on the results: ” I wanted to not know that fact for as long as I possibly could. A gray sky hung over Washington. I couldn’t help but interpret it as funereal. It’s a nice book, though perhaps not exciting enough for some – but can a former First Lady ever say what she really thinks? 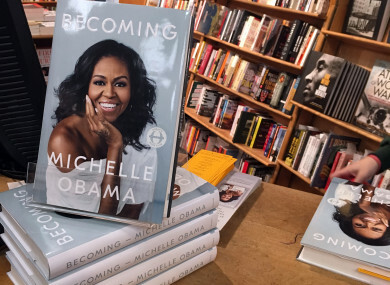 Becoming by Michelle Obama is available in bookshops now. It’s dedicated to her friends family – and of course Barack, who the author said: “Always promised me an interesting journey”. Becoming by Michelle Obama, published by Viking, is out now. Email “What we learned from reading Becoming by Michelle Obama ”. Feedback on “What we learned from reading Becoming by Michelle Obama ”.